Unfavorable weather conditions last fall and winter meant more hay was fed than normal causing last year’s hay supplies to be running short. Unprecedented weather extremes through the spring are affecting the quality and availability of new hay for 2011. Whether you are suffering through the extreme drought in south Texas, excessive rainfall in the Midwest, or unseasonably cool temperatures in the Northwest, harsh weather conditions have affected hay production in many regions of the country. Pressure from high grain prices and government support of biofuel production is also causing some hay farmers to shift acreage from hay production to corn, switchgrass and other crops. Projections are that 2011 may be lowest hay production year since 1994. 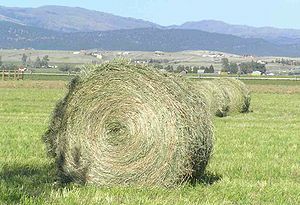 Short supply and high demand could lead to record hay prices in 2011. -quality hay will likely be hard to find and/or very expensive. This entry was posted on Saturday, March 24th, 2012 at 2:53 am	and is filed under Horse, uncategorized. You can follow any responses to this entry through the RSS 2.0 feed. You can leave a response, or trackback from your own site.